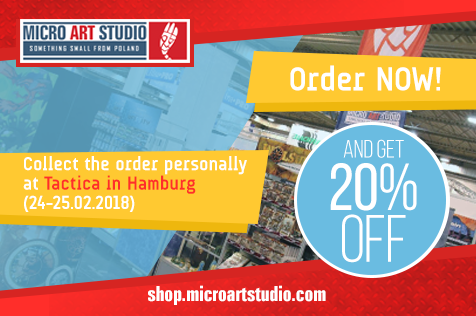 Micro Art Studio haben zur Tactica wieder eine Rabattaktion vorgestellt. Are you going to Hamburg for Hamburger Tactica? If so then remember that you will be able to place advance orders with 20% discount to be picked up at our booth at the event. 4) and don’t forget to collect the order personally at Tactica! IMPORTANT: Please remember that orders have to be placed no later than on 18th of February, 23:59 CET. Orders placed beyond this date may not be completed on time. Please keep in mind, that this offer comes with personal pick-up at Tactica ONLY.